In the corporate world executives receive high amounts of compensation including salary, stock options, restricted stock, perks and many others, which in some cases could amount to millions of dollars. It is often argued that executives of large Fortune 500 corporations get a large paycheck as an incentive to perform well in order to reward shareholders with increased wealth. When times are good and stock prices are soaring to new all time highs, most investors are happy enough to have increase in their net worth. When times are tough however and companies are cutting back staff, dividends and capital expenditures in order to maintain an adequate liquidity, excessive CEO pay does stick out as an outlier. I recently read an article from the NY times which provided a “List of Highest-Paid CEOs for 2008”. On average the stocks of the companies led by the highest paid CEOs fell by 51.33% in 2009. This was much worse than the 37% negative return experienced by S&P 500 in 2008. The average yield of the stocks in the list is about 1.67%. Only two companies raised their dividends in 2008 – Phillip Morris International (PM) and Chesapeake Energy (CHK). On the other hand Citigroup (C) cut its dividends by 70%, while Motorola (MOT) eventually decided to suspend its dividend most recently. The case for Motorola is particularly intriguing, as the total pay for its CEO in 2008 would have covered almost all of the dividend payments for one quarter. 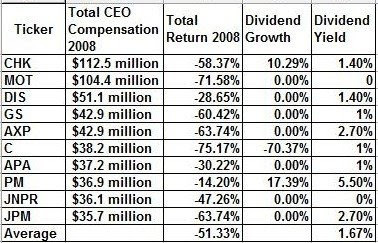 The elimination of the dividend is a pretty good example of an alarming trend in modern corporations where top management seems to get rewarded, while shareholders end up paying for all mistakes with their hard earned cash. While I agree that maintaining liquidity is important for most companies whose business is cyclical in nature, as a shareholder I disagree that company executives should be receiving enormous compensation during tough periods for business.